I'm embarking upon an epic fitting exercise and learning to sew the perfect fit this year, following along with the Craftsy course of the same name and the lovely instructor Lynda Maynard. You can read Part 1 of the series at 2013 is the year of Sew the Perfect Fit, Part 2 at Muslin Bodice Adjustment, Part 3 in Bodice Pattern Adjustment and Part 4 in Making a Skirt Muslin. Today, altering sleeves, armholes and truing a pattern. Lesson 10 – Truing the pattern and final check. Well I had chosen the sleeveless dress pattern so although I closely watched lessons 8 and 9, I didn't need to make any alterations to my dress for the sleeves. I sometimes have problems with very low armholes, and will now know how to deal with this should it come up in future, but the bodice on this dress seems to be just fine. The sleeve and armhole lessons were very well received by the other students in the course and her cut on sleeve gusset caused a lot of excitement, and gave great movement. If you find sleeves restrictive, then this adjustment is for you. Sorry that I can't give more info and personal examples on this part of the course – you'll just have to watch that for yourself. But Lynda talked us through a lot of adjustments and again used real examples on all 3 fitting models. The final lesson talks us through truing the pattern. After so many adjustments were made individually to the bodice and the skirt and then transferred to the pattern pieces, its possible that some of the seams no longer match in length. Perhaps more was added to the waist of the bodice than was added to the waist of the skirt for example. 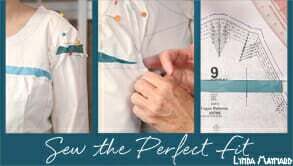 Lynda talks us through how to true up all of the seam lengths and adjust where necessary and how to make any final adjustments to our pattern before making the final test garment to make sure we are happy. I was delighted to find that by following her lessons carefully, almost everything still matched pretty much perfectly and I only had to make a couple of very tiny adjustments to get everything to match. Obviously as well as a good fit, we still want darts and side seams to match up perfectly in our final dress. So what's next? In the final lesson Lynda shows us the final muslin and any last minute small alterations noted. Fitting is clearly a process of small adjustments. As you make one adjustment, adjust the pattern and make other adjustments before making another muslin – something else might have changed. 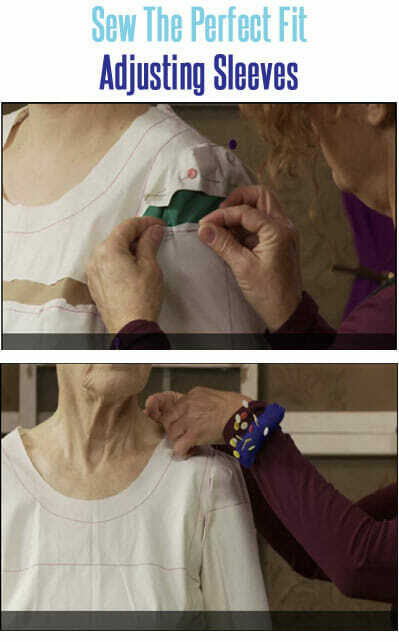 She makes it clear that Sewing the Perfect Fit often requires several test garments each with smaller adjustments until the perfect fit is achieved. But – you know me by now. It wouldn't be much fun if I kept showing you lots of muslins with little changes so in the final post in this course I'll be jumping straight in to using my altered pattern to make a dress. Let's hedge our bets and hope it will be a ‘wearable muslin'. I'm not yet expecting the perfect fit on my first try, but I'm delighted with what I've learned so far. The Regis Dress and Navy Lace Dress. Sleeves drive me nuts. I am making a knock off uniform and am going easy with swapping sleeves, but I am not looking forward to doing it. Ooh, I hate fitting and altering sleeves! Thanks for the reminder and tips! I just bought this lesson a few days ago and have watched most lessons. I can’t wait to actually put it to use! Love your blog. Great tutorial! I just pinned it!